The author journeys to Afghanistan and discovers that Afghan women don’t need us to rescue them. They need security and education in order to flourish on their own terms. A slightly beat-up red Toyota Corolla pulled up outside our hotel in Kabul. Walid,* our driver, smiled as I took a seat next to him in the front. Lauryn climbed into the back seat, a black and grey head scarf over her blond hair. Men in the front, women — with heads covered — in the back. This was only my second morning in Afghanistan, and already I was following the local custom assigned to my gender. Lauryn Oates is the projects director for the Calgary-based development charity Canadian Women for Women in Afghanistan (CW4WA). I have known Lauryn for three years; we met in Vancouver through our shared work with the Canada-Afghanistan Solidarity Committee, a group of activists committed to building democracy in Afghanistan. She has made over 20 trips to Afghanistan since 2003. On this day, we were going to a village school to see a ceremony for teachers graduating from a CW4WA training program. Before leaving the city, we stopped to pick up Angela (not her real name), a 19-year-old Afghan who would be our translator for the day. During the hour-long drive to the Kalakan District, Angela told me about growing up in extreme poverty in Bamiyan province. With hard work and a bit of luck, she earned a scholarship to do two years of high school in Iowa, of all places. Today, with the help of a small leadership school in Kabul run by an American, Angela is applying for international university scholarships. She smiled and laughed constantly as she talked; I’ve never met a more pleasant person in my life. After barely 24 hours in Kabul, I was already relieved to escape the city’s frantic, gridlocked traffic for the open air of Afghanistan’s countryside. Walid weaved back and forth on the single-lane highway, dodging motorcycles, donkey carts and bright caravans stacked impossibly high. Lauryn pointed out the white markings on buildings and fences showing that the area had been cleared of landmines. Arriving in Kalakan, a small crowd outside the school greeted us warmly and invited us inside. The building is little more than a ceiling and walls. It has no plumbing, no heat for the winter months, and furniture that Canadians might find in a one-room schoolhouse museum. But tacked on the walls are brand-new maps of the solar system and animal charts with names in Dari and English. Lauryn, Angela and I drank tea with the principal in his office. Many of the student teachers had been doing their job for years without any formal training or support, he explained. Some are barely educated themselves. The original contract called for 500 teachers to go through a basic training program, but the demand was so great — neighbouring villages begged to have their teachers educated as well — that CW4WA trained 1,500 teachers using the same budget. Back in one of the classrooms, the graduation ceremony began. All of the teachers in this class were male, and some quite old. At the ceremony, Lauryn brought greetings and congratulations from CW4WA, with Angela translating. Ten years ago, when women required the permission and accompaniment of a male relative to leave the house, Angela could have been executed for this. In that instant, something clicked. These Afghan villagers are the very people who are continually slandered as backward and tribal. Yet this man was asking for resources on behalf of all students — male and female. Outlawing women’s education is just as repulsive to him as it is to Angela, Lauryn and me. Too often, the views of the most reactionary and violent groups in Afghanistan are assumed to represent the views of the majority. It takes a single day in the country to understand that Afghans and Canadians have much in common with one another. Nevertheless, it also takes just one day to sense the cultural battles taking place within society. On one hand, there is Angela’s hard-fought freedom to get an education. On the other is the custom that I should ride in the front seat while Lauryn sits in the back. The war between the Taliban and the Afghan government and their international allies is very much about Afghan women — although not in the patronizing manner in which this point is usually discussed. We are not in Afghanistan to emancipate women; the Afghan women I’ve met can do this for themselves. We are in Afghanistan to enforce a democratic constitution, a difficult and complex but necessary task. With the theocratic Taliban in power, an Afghan woman could not even try to emancipate herself without the risk of being murdered. Until the capacity of the Afghan army and police grows, the country needs the continued presence of United Nations-backed international security forces. Today, millions of Afghan women are fighting to claim an equal place in society, often at great cost to themselves. Every vital element of a democratic, prosperous society — access to education and health care, relief from poverty, accountable government — can only progress if women are included in the struggle, as they are right now. More Canadians need to ask themselves how they can be an ally and friend of this cause, because its success is the only chance Afghanistan has for true and lasting peace. During Taliban rule, Shah Gull Rezayee risked her life by operating a secret school for boys and girls. Yet today, she may be in more danger than ever: Rezayee recently campaigned for re-election. When Lauryn and I spoke with her at her Kabul residence, she had not received the voting results, but a few days later we learned that she kept her seat as a member of parliament. It is dangerous for her to visit her constituency in Ghazni City, although this hasn’t stopped her from doing so. “If the Taliban see a woman who is a member of parliament, they will kill her,” she says. During the summer campaign period, the Free and Fair Election Foundation of Afghanistan reported that 90 percent of threats against candidates were against women. This included “persistent, threatening phone calls, often late at night, verbal threats, and night letters warning them to cease campaigning or face violent retribution.” In Herat province last August, the Taliban abducted 10 campaigners for the female MP Fauzia Gilani. Half were released; the rest were murdered. The Afghan constitution stipulates that at least a quarter of parliament, 68 of 249 seats, must be allocated to women. In the parliament formed after the 2005 election, 28 percent of MPs were female. The Canadian Parliament currently has 67 female MPs, down two from the record 69 — or 22 percent — elected in 2008. Najia Haneefi is the former executive director of the Afghan Women’s Education Centre and is a founding member of the Afghan Women’s Political Participation Committee. She now lives in Ottawa but spent the summer in Afghanistan, assisting female candidates with their campaigns and monitoring the process. She noted a few differences between this campaign period and the last one. The female journalists who report on Afghan politics face similar dangers. Farida Nekzad is a founder of the Pajhwok Afghan News and the director and editor-in-chief of the Wakht News Agency. When the Taliban seized Kabul in 1996, Nekzad joined the stream of Afghans who fled to Pakistan, but she returned after 2001 to work as a journalist. “The security problems started for me in 2003, when I started writing about warlords and human rights,” Nekzad told me in her office. At the time, she was writing for the Institute for War and Peace Reporting and was also working as a media trainer, helping to coach almost 500 journalists. In 2007, she received multiple awards, including the International Press Freedom Award from Canadian Journalists for Free Expression. Security threats against her increased to the point where residents of her apartment building asked her to move out after bombs were found inside. It’s impossible to say who was behind the threats. Nekzad told me that a good journalist in Afghanistan will soon have three enemies: the Taliban, the warlords and the government. Shortly after the bombs were found, the Committee to Protect Journalists asked Nekzad to come to the United States out of fear she would be assassinated. She declined the invitation. “I want to help my country. I want to stay here and do my job.” She did, however, move to India for a few months before returning to Kabul with a lower profile. Making brave career decisions is becoming harder for Nekzad. She has a young daughter, and so risking her life also means risking her family’s. After years of dangerous work, nobody would blame her for choosing safety. Yet Afghanistan desperately needs women like Farida Nekzad and Shah Gull Rezayee, women who refuse to be cowed by intimidation and violence. A bomb exploded in Kandahar City the morning Lauryn and I arrived. It was a small one, not likely to make international headlines. Three layers of police checkpoints around the city have mostly stopped the large car bombs. But the Taliban are waging a ferocious assassination campaign against local government officials, and nobody in a prominent position feels safe. Kandahar City is the second-largest city in Afghanistan and perhaps the most symbolically important in this war. It was the first foothold of the Taliban in 1994, and it’s the last place they defended before retreating to Pakistan in December 2001. For the past five years, Kandahar has been the centre of Canadian security and development efforts. Currently, it is the most active war zone in Afghanistan, as an influx of American and Afghan soldiers fights to push the Taliban out of the city’s surrounding districts. Lauryn and I spent the morning drinking tea at the home of Ehsanullah Ehsan, who was overjoyed to see us. Ehsan is the director of the Afghan-Canadian Community Centre (ACCC) and has lived in Kandahar for most of his life, though he, too, fled to Pakistan during the Taliban era. After lunch, Ehsan drove us to the ACCC, located in the heart of the city. The contrasts between Kandahar and Kabul were immediately apparent. In Kabul, the international military presence was barely visible, apart from the occasional helicopter flyover. I often walked around by myself. Women were out in the streets and working in shops, and only a few wore burkas, the full-body covering mandated under some Islamic traditions. In Kandahar, there was no mistaking that the country was at war, and to be foreigners in the city without security protection, as Lauryn and I were, was dangerous. Almost every woman wore a burka. Kandahar is a tough reminder of what it takes for women to even begin the struggle for equal rights. In November 2008, 11 Kandahari girls and four teachers were sprayed with acid as they walked to school. Arrests were made and the victims eventually returned to school, but the psychological damage done to the community lasts. Ehsan told us that when the ACCC gets too much local media attention, the attendance of female students drops dramatically. The ACCC is essentially a community college offering courses on literacy, computers, business management and English. Two shifts separate the students by gender: girls come in the afternoon, boys come in the evening. The school has a partnership with the Southern Alberta Institute of Technology, and in one room, we saw a student talking with a professor in Calgary over Skype. The ACCC’s Internet connection is paid for by the Canadian government. At a graduation ceremony arranged to coincide with our visit, Ehsan addressed the 40 girls who were graduating. All of them had learned English. “You have proven a lot of people wrong who think that women are second-class citizens,” Ehsan said, his voice growing louder. “I know there have been hardships for you. But I am proud of the results you have achieved. You are fighting for enlightenment. You are fighting for civilization. You are citizens of the world.” The room erupted in applause. Most Kandahari girls are raised to avoid contact with men who aren’t their relatives. These female students have grown comfortable with their male teachers, but classrooms fell silent when I walked in. A few girls were very talkative and told me all about what they were planning to do after they graduated, but the majority avoided even making eye contact with me — a stark contrast from the classrooms of Kabul. At the end of the afternoon, all of the girls donned their burkas before walking out through the gate to go home. It was hard to watch them do this. Inside the school they laugh, ask questions and associate as they please; they are free. Outside, they are completely hidden from the world, save for a screen over their eyes. As we drove home through the city, I commented to Lauryn about how lively the streets felt. It was dark, but there were people everywhere, milling outside shops and cafés. “Yeah,” she responded, “but look — no women.” I was astounded to see that she was right. In the five years before 2001, all of Afghanistan was like this. Everything in Afghanistan is more complicated than it should be. Lauryn and other aid workers expect the Taliban to cause problems; it is perhaps more frustrating when institutions that are supposed to be on the side of democracy and social justice hamper such work. The Afghan Ministry of Education is notorious among both Afghans and international NGOs. As with so much of the Afghan government, bribes are necessary to get anything done. But it is particularly aggravating when the ministry actively impedes the progress of educating a new generation of Afghans. The Marefat School is located in a vast slum on the outskirts of Kabul and provides quality education to students from Grades 1 to 12. The Hazara community, one of Afghanistan’s most persecuted minorities, runs the school through donations from local families. Hanging in its boardroom are portraits — painted by students — of Einstein, Spinoza, Descartes, Voltaire as well as thinkers from Persia, India and elsewhere. Because Marefat is a privately funded school, it was initially able to organize its own affairs, offering courses in political science, economics, human rights and anthropology. Boys and girls attended classes together. Then the Ministry of Education declared that students wanting to take the entrance exam required for university had to graduate from an officially recognized school — with an officially recognized curriculum. Marefat is still a bastion of progressivism, but it is prohibited from offering courses outside the basic maths and sciences, and it has been forced to build a separate facility for girls. 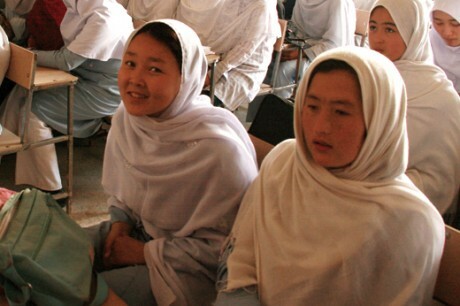 Other obstacles to education in Afghanistan are caused inadvertently. Rahraw Omarzad is the director of the Centre for Contemporary Arts Afghanistan. He considers Afghan art, almost all of which was banned under the Taliban, to be too “traditional.” A trip to Europe convinced him that Afghan artists needed the chance to experiment, so he opened a facility where they could study and create contemporary art. Omarzad’s centre is controversial — he has been accused of “westernizing” Afghan culture — but also very popular. In his latest round of workshops, which cover everything from painting to photography to filmmaking, 1,000 students applied for 100 spots. But Omarzad will choose only female students from among the applicants because he cannot find funding for male students. While everyone who pays close attention to Afghanistan acknowledges the regressive, anti-women beliefs held by a significant portion of Afghans, I bristle when Afghans are lumped together into a monolithic bloc of backwardness. A deep irony of the international emphasis on women’s oppression in Afghanistan is that the many men who support women’s rights — and who are frequently in mortal danger for their convictions — are generally forgotten. Grants for men’s programs are almost impossible to obtain. International organizations should continue to fund and deliver programs that support women’s rights — but they must be implemented carefully and sensitively. Marnie Gustavson is the executive director of Physiotherapy and Rehabilitation Support for Afghanistan, which, incredibly, has been operating in Afghanistan since 1996. Gustavson is American but speaks fluent Dari; she grew up in Kabul in the 1960s and returned in 2003. Among other programs, PARSA works with villages on small projects to assist the marginalized and disabled. Hard lessons taught Gustavson how to do this sensitive work. “I’ve seen so much damage done by gender programming here. I’ve seen other organizations who only wanted to work with women, and I told them that they have to work with the whole community.” If the economic status of women in the village is raised too quickly, it can generate a backlash; the women will be resented and ruthlessly exploited by their male family members who still have nothing. Gustavson left me with a final thought: the best work being done in Afghanistan to help the cause of peace and women’s rights is the work we never hear about. The most effective projects are implemented on a small scale, use local knowledge and are sensitive to the needs of the community. Yet, as is so common in Afghanistan, there is a contradiction. The small-scale projects are practically impossible without the large-scale efforts to keep the Taliban out of power, to build electricity and transportation networks, and to run a proper education and health-care system. And the large-scale projects are almost always going badly. The Omid-e-mirmun orphanage for girls is one of CW4WA’s signature projects. As I relaxed in its living room, the girls slowly filed in. They love visitors and will sit perfectly quietly, listening, even if they cannot understand a word of English. One of the girls commandeered my notebook from me and filled 10 pages with drawings. Like every humanitarian centre in Afghan-istan, Omid has its struggles. It is in a new, bigger space after outgrowing its last one, but the landlord is threatening to raise the rent. Rent all over Kabul is skyrocketing. It will be difficult to move again. This room of girls at once represents Afghanistan’s dire poverty, the immense hope that exists for its future and the agonizing obstacles that stand in the way. These girls are the lucky ones; UNICEF estimates that one of every four Afghan children will die before the age of five. If not for Omid, many of these girls would be living on the streets or in forced marriages to men five times their age. Yet all of them were smiling. They were warm and friendly. And sitting with them, I felt the same way that I felt at the graduation ceremony at the Afghan-Canadian Community Centre or in the classrooms at Marefat School, where 14-year-old girls were working through English grammar together: these people are no different from us. When I hear Canadians make the argument that we cannot impose democracy or “our values” on Afghans, it makes me want to scream. As if Afghans don’t want these human rights! Education and democracy and women’s rights are not owned by the West. They are universal. As Najia Haneefi likes to say, “The West has nothing to teach Afghan women about feminism. They already know.” But what Afghan women do need is our uncompromising support. Just before leaving Afghanistan, Lauryn and I returned to the Omid orphanage. Between the two visits, four of the girls from the orphanage had been accepted into the leadership school that Angela attends. Once there, they will start preparing to apply for scholarships overseas. The mood in the room was triumphant. Brian Platt spent 10 days in Afghanistan in November. Posted by Omid Jafari on Mar 5 2011. Filed under Afghanistan, Hazarajat. You can follow any responses to this entry through the RSS 2.0. Responses are currently closed, but you can trackback from your own site.